Please be aware some UK dealers are retailing Grey Imports and the Icom IC 7300 will not be covered by warranty at Icom UK. 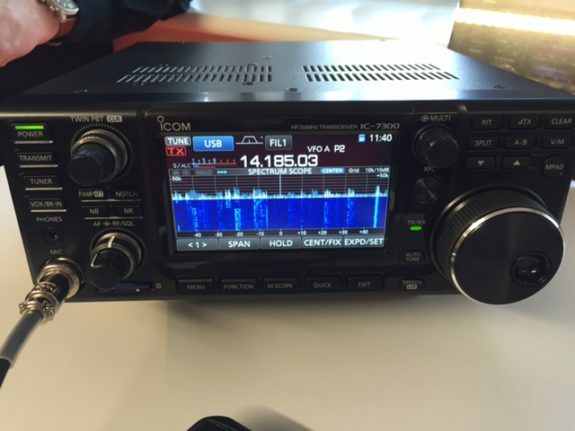 Icom IC 7300 SDR Transceiver. 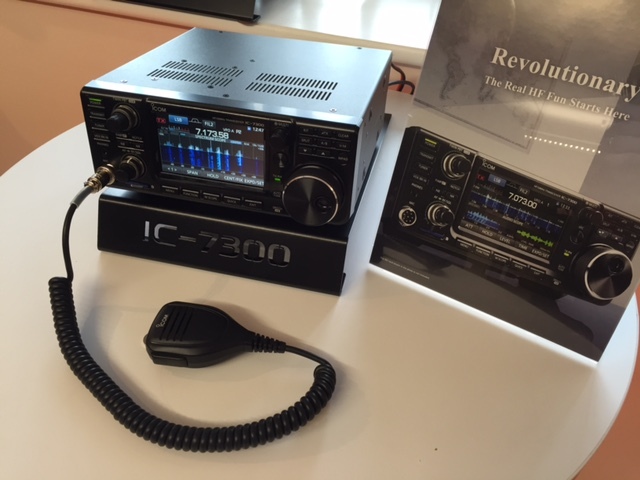 The All New Icom IC-7300 transceiver on display at the Tokyo HAM Fair. Icom Inc. had a huge amount of interest on its stand at last weekend’s Tokyo Ham Fair 2015 with the timely unveiling of the New IC-7300 HF/50/70MHz Transceiver. 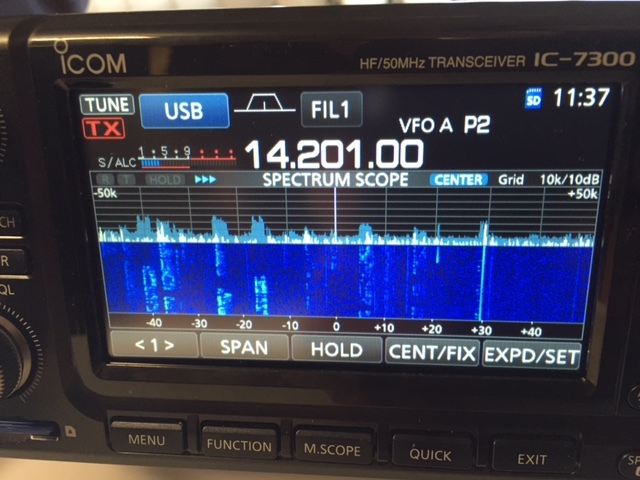 The launch, which caught most people off guard, saw the manufacturer introduce a new mid-sized base station transceiver incorporating the latest RF direct sampling system, a real first for an Amateur radio transceiver*. 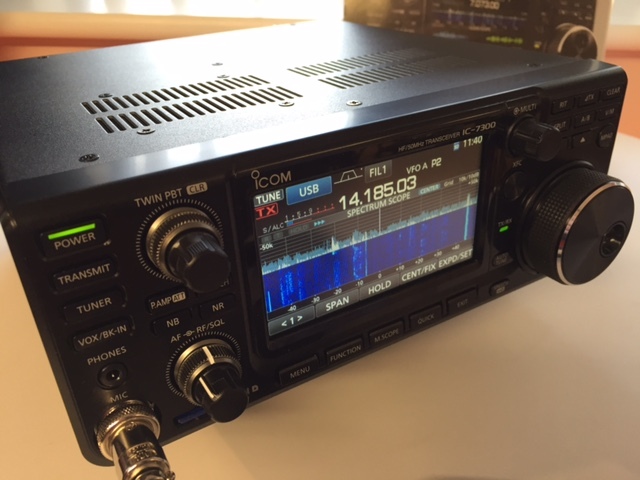 The IC-7300 transceiver, an aesthetically, attractive looking base station, features a 4.3-inch touchscreen colour TFT LCD screen with a high-performance real-time band scope. 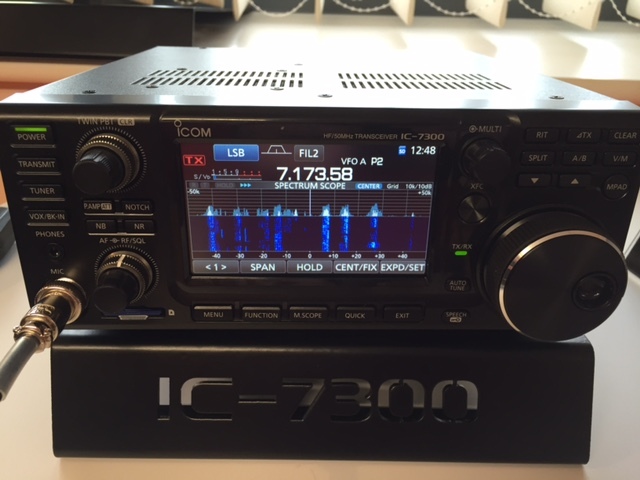 Another first for an Amateur radio transceiver, the IC-7300 uses an RF Direct Sampling System, a technology normally seen in Software Defined Radios. RF signals are mostly processed through the FPGA (Field-Programmable Gate Array), rather than by physical devices enabling high-performance real-time spectrum scope in a compact body. 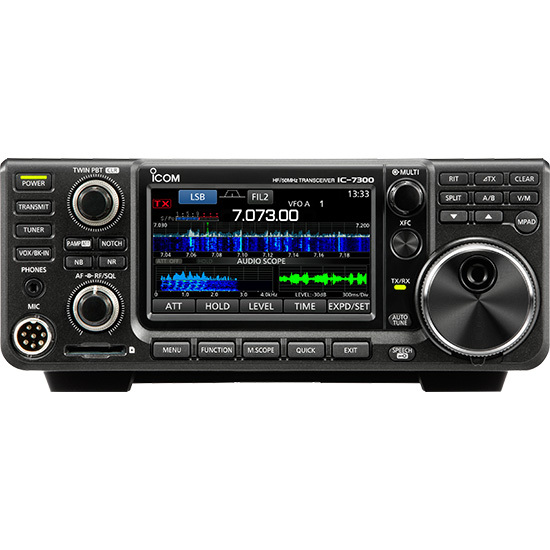 The Icom IC-7300 includes a built-in integrated wide-frequency Automatic Antenna Tuner making ideal for field operation. 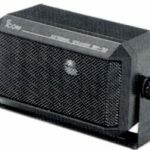 The radio provides 100 watts output power on HF/50MHz bands and 50 watts on 70MHz (European versions only). The High-quality real-time spectrum scope Now, a serious spectrum scope is NOT a “privilege” of high-grade models. The IC-7300 comes loaded with high-resolution real-time spectrum scope. Its real-time spectrum scope with waterfall function provides top-level performance in resolution, sweep speed and dynamic range. Number of dots shown at the 60 dB level, when receiving a single carrier. 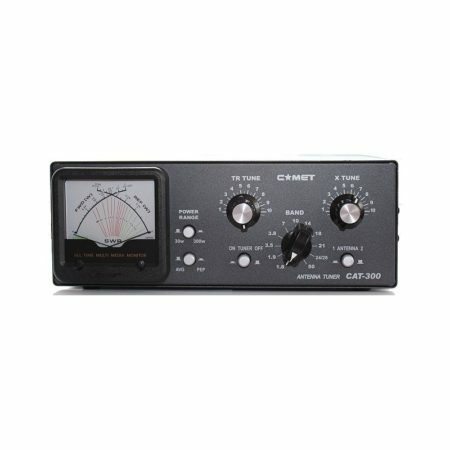 RF Direct sampling system — a first in Amateur Radio*Instead of the conventional superheterodyne system, the IC-7300 utilizes the RF direct sampling system — a real first in an amateur radio transceiver. This technology is seen in Software Defined Radios and other radio equipment. RF signals are mostly processed through the FPGA (Field-Programmable Gßate Array), making it possible to eliminate physical mixer and filter devices and offer a high performance real-time spectrum scope in a compact body. 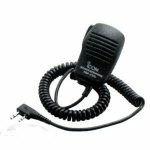 * Researched by Icom, among major amateur radio manufactures. Class leading phase noise characteristics.Overcoming cost and performance limitations of the superheterodyne system, the RF direct sampling system pursues ideal high performance phase noise. As the result, compared to the IC-7200, the IC-7300’s phase noise characteristics are improved about 15dB (at 1kHz frequency offset). This superior phase noise reduces noise components in both receive and transmit signals. Large touch screen color TFT LCD. The IC 7300 has a large color TFT LCD and it can be used as a touch screen. This user-friendly interface provides intuitive operation. Using the software keypad of the touch screen, you can easily set various functions and edit memory contents. Multi-dial knob for smooth operation.When you push the multi-dial knob, menu items are shown on the right side of the display. You can select an item with a touch of the screen and adjust levels by turning the multi-dial knob. 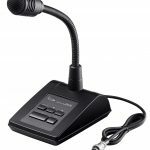 This combination of the multi-dial knob and touch screen offers quick and smooth operation. 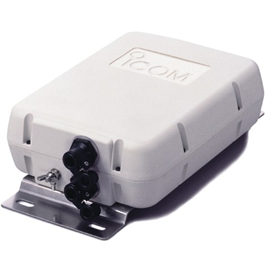 The high-speed automatic antenna tuner is built into a compact chassis (240 (W) × 238 (D) × 95 (H) mm; 9.45 × 9.37 × 3.74 in). Light weighgt you can easily carry the radio and enjoy field operation. To offer optimum sound quality, a new speaker unit is employed and is allocated sufficient space in the sturdy aluminum die-cast chassis. Memory keyer functions for CW and RTTY.RTTY decode log function. USB for CI-V and audio input/output. Large cooling fan system.function meter. 101 memory channels (99 regular and 2 scan edge channels). 100W output power on HF/50MHz bands and 50W on 70MHz band (Europe versions only). SSB, CW, RTTY, AM and FM modes. Reference level adjustment Yes (–20dB to+20dB). Span width 5kHz–1000kHz Maximum hold indication Yes(10 sec., continuous). Resolution* 1 dot minimum (approx.) Average indication Yes. Waveform display area(Vertical axis) 80 dB (indicated area). Touch screen operation Yes(Changing frequency). Near The Alhambra Shopping Centre.Barnsley, South Yorkshire, UK.Amateur Radio Sales. hamradio-shop is my favourite HAM store!HAM Radio Shop, HAM Radio Shops, Amateur Radio Dealers, Amateur Radio Dealers UK. 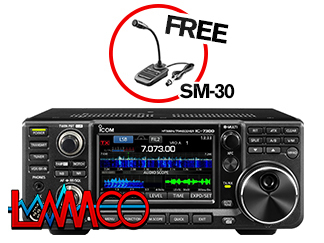 Icom IC-7300 Amateur Radio Shops HAM Radio Dealer Supplier Retailer.